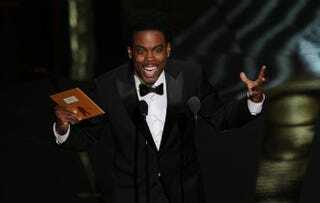 Chris Rock performs at the 84th Annual Academy Awards on Feb. 26, 2012, in Hollywood, Calif.
Cringe at any talk you hear about how Chris Rock ought to quit his hosting gig at this year’s Academy Awards to boycott the upcoming event alongside the other black celebrities who plan to. Because if you know anything about Rock, you know that the first things that’ll come flying out of that man’s mouth are jokes about the #OscarsSoWhite controversy. Variety confirms that hunch with a report about how Rock completely scrapped the monologue he was originally going to use to open up the Academy Awards and went back to the drawing board after people like Jada Pinkett Smith; her husband, Will Smith; and Spike Lee kicked up dust about how the Academy Awards can’t seem to recognize quality performances when they’re done by black actors. Reginald Hudlin, a producer for this year’s awards show, explained to Entertainment Tonight on Saturday how Rock literally had to start from scratch to account for all the new race discussions surrounding the awards show. It’s nice to hear that the academy is giving Rock free rein to address the controversy as he, an African American, sees fit. Go in, Rock. Go in.